#HEWEB16 Conference Attendee Beware: Do Your Homework! I love the High Ed Web conference: it’s a great place to take the pulse of our professional community, discover new ideas & new colleagues, make new friends, see old ones — and have some fun in the process. It’s a full-packed conference with fantastic sessions — but let’s not kid ourselves: if you want to make the most of the conference, you have to do your homework. Since it is really tough to choose among all the great sessions and talented presenters, you want to invest a bit of time ahead of time to look at the schedule and make your selection at the office. While I won’t make the trip to Memphis next week, I still went through this selection process, because it’s part of my job at Higher Ed Experts to know what’s out there. I read all the session descriptions, made a first cut of 34 then a second of 16 sessions – the final selection I’m sharing with you below. It’s the same process I used a couple of weeks ago to create the program of the 4th Higher Ed Social Media Conference with all the proposals I received. There are many, many fantastic speakers (and even friends I admire and like very much) and great sessions that aren’t listed below (but you can find them all on the schedule including the 2 keynote speakers & the poster sessions). I made this selection focusing on interesting and important topics. This list is just a list – it’s not THE list, so if you’re not there feel free to add a comment to tell us all why we should attend YOUR session. MONDAY, 8:30 – 9:15 a.m.
• How the project mindset is damaging your website. • Demonstration of an operations management system that streamlines requests and task management, improves internal and external communications, and provides resource tracking and reporting. Mark Greenfield is a veteran in our industry, but also a seasoned presenter. At High Ed Web, his presentations are classics. This session focusing on processes will also be super useful if your department is still mainly project-based. MONDAY, 9:30 – 10:15 a.m.
After years of delegating content to campus departments, an IA overhaul caused the Marketing and Communication department at Xavier University to rethink who maintains the content for key sites. The end result meant taking back control of many websites that for years had been maintained by academic departments and support offices. After a brief review of the overall project we will look at the sites we decided were too important to delegate, how we brought them back in, and the obstacles we have faced. Going from a centralized to a distributed content publishing model is common. Doing the reverse, not so much. That’s why I think it’s worth listening how Xavier did it as they have proved over the years to make risky yet innovative moves. – the legalities of texting. – how to gracefully manage opt-in, opt-outs. While this session is in the corporate track, it’s the only one at the conference focusing on one of the major untapped communication channels in higher ed. According to the 2016 Student E-Expectations Survey, 74% of high school seniors would give permissions to colleges to text them. Only 36% received such texts. MONDAY, 10:45 – 11:30 a.m.
Every year, universities have dozens of major events ranging from graduation to giving days. William & Mary’s Tiffany Broadbent Beker (University Communications) and Sarah Juliano (University Advancement) will explain how they approach these varied events – what’s worked, and what hasn’t. They’ll address the ever-tricky balance between engagement and fundraising on university social media channels and suggest innovative ways to have the entire campus community help distribute your message and promote your event. During this session, they’ll discuss how to set social media expectations, ways to collaborate with your peers across campus, suggestions for creating and executing a hashtag, and how to create a social media guide to make each event one to remember. Social media and events are a match made in heaven. Yet, it’s not easy to make the most of this combo. I’ve first heard Tiffany present about the topic at the 2015 Higher Ed Social Media Conference – her session was a big hit. A common criticism of Agile is that it works well for developers but can be awkward and difficult to adopt for content strategists, user experience engineers, and visual designers. This poses significant challenges to integrated, cross-functional teams who want to adopt Agile as a single methodology for all of their work. This is especially true in higher ed, a culture that is still more comfortable with traditional project management methodologies, fixed budgets and deadlines, and a waterfall approach to planning. – Visual design/theming and final testing and deployment We will cover process, tools, and deliverables for each of these dimensions and demonstrate several adaptive strategies for involving product owners with varying levels of skill and commitment in the Agile process to ensure the success of their web projects. If you are new to Agile and considering its use, this talk will help you anticipate some of the challenges ahead and offer sound strategies for meeting them. If you are already using Agile, then hopefully you will learn something new and share your own approach. Whether you manage a cross-disciplinary web team, subcontract the lion’s share of building your web presence, or work as an army of one, this approach has a lot to offer. The need for content has never been as high as it is today. Any approach that can help in content production is worth learning about. I was first introduced to the idea of using Agile for content in the 2015 Higher Ed Content Conference in a session presented by Richard Prowse from the University of Bath. MONDAY, 11:45 a.m. – 12:30 p.m.
We all know that person — the one who stays focused solely on the task at hand, doing only the work dictated by his or her job description. They may have incredible depth of knowledge and specialized skills — and quite possibly, a lot of education to back it up — but is that what it takes to be successful? Or can the common generalist’s outlook help your team step up their game? What if…everything was your job? What if we are working from the wrong job descriptions? What if, rather than focusing on our own success, we started to ask different questions that focus on our team’s success? How do we promote the success of the team as a whole? What would that look like? How would our focus change? This presentation takes a look at how, by turning the question around, we can change our culture and create stronger teams as a result. We’ll discuss why teamwork matters, and how you can contribute to the team in ways outside any job description, that will result in success not only for you and your team, but your institution as well. And really, isn’t that our job after all? I’ve always secretly believed that generalists will rule the world – one day :) More seriously if you’ve worked in higher education for more than a few months, you know that nothing can happen without teamwork. Robin Smail is a rockstar presenter (literally) full of energy and experience on how to deal with the human part of our work. MONDAY, 3:00 – 3:45 p.m.
Each year, the E-Expectations report summarizes the online behaviors of college-bound high school students in order to inform and improve e-recruitment strategies. For the first time, a fall survey was administered to learn about behavior variances that occur when high school students transition from junior to senior year. Attend this session and be the first to learn about trends and behaviors among juniors and seniors as they use digital marketing resources to explore their college enrollment options. Stephanie and Lance will discuss prospective students’ use of websites, email, texting, paid marketing, social media, forms, and more. Additionally, they will compare the spring and fall survey data and explain how the results should influence your own e-recruitment practices. By the end of the session, attendees will: 1. Understand what campuses need to do to meet the online expectations of college-bound high school students at all stages of their college search. 2. Know how to manage their institution’s digital presence across multiple channels, including the campus website, email, and social media. 3. Learn how mobile device usage is changing how students browse websites, complete forms, and interact with campuses online. I love data and I’ve been lucky to dive into the results of the 2016 Student E-Expectations Survey over the summer. If you haven’t read my 4-part series about this study or haven’t attended this session at another conference, this is a must-attend session. Virtual reality is coming, and it’s coming fast. In December 2015, the New York Times distributed over 1 million Google Cardboard viewers to its print subscribers. YouTube and Facebook both support 360 degree videos, and WebVR is bringing virtual reality content out of the realm of high-end gaming and specialized devices. Some experts predict VR will be bigger than the film industry within 10 years. What does this mean for higher education? With a new and cheaper gadgets released seemingly every day, the technology is becoming more and more accessible. Come hear how Colorado College is leveraging this new medium, what we’ve learned, and how you can get started–even with limited time and budget. 360 videos are the next, next big thing, right? While we are still at the early adopter stage, virtual reality and 360 videos are in our future. MONDAY, 4:15 – 5:00 p.m.
Higher education is a notoriously decentralized environment — and one of the most difficult to reign in when it’s time to change your school’s content culture. A bit of nesting (visualize Russian nesting dolls) can prepare an organization by providing flexibility while managing individual needs and creativity. In this session, you will learn how the University of South Carolina was able to implement change to build on research-driven brand strengths and created harmony across content teams by layering key university messages, attributes and values to lead content development in teams from publications, web, internal communications, social media and more. Learn how to: • Layer your content strategy to add meaning without overcomplicating your message. • Provide flexibility for content creators while still maintaining brand cohesiveness overall and prepare your teams for change. 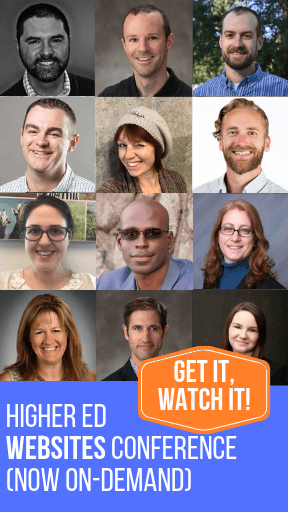 • Identify champions in your team to help spread the message and build a content culture that everyone can rally behind to bring harmony to a house of chaos. Amy Grace gave the short version of this presentation at the 2016 Higher Ed Content Conference. It can work as a great roadmap to roll out content strategy across your institution. Amy is also a great presenter and an expert content strategist. TUESDAY, 8:30 – 9:15 a.m.
Personalization gets a bad rap for being a creepy practice. But given the complexity and depth of higher ed websites, delivering relevant content and calls-to-action to our wide range of unique users quickly and efficiently is a must. By serving users dynamic content that speaks directly to their unique needs and communicates in a way that appeals to them, we can cultivate deeper understanding, drive more meaningful actions, and foster stronger relationships. We can accomplish this by inviting user research and content strategy to the party. In this presentation, we’ll use case studies to explain the process behind creating an effective, sustainable, and unobtrusive digital personalization experience that provides relevance for the user and ROI for you. This includes developing personas, identifying user needs and tasks, applying these insights to your website’s information architecture and user flows, developing and delivering relevant dynamic content, and analyzing user behavior to gauge success and refine your approach. The result? A personalized experience that is less like a creepy robot, and more like a friendly human who knows what you need and when you need it. Mass personalization is a hot topic on the web now. Not just because it’s trendy, but because this is what young users want and expect. So, it’s definitely time to learn more about the topic. TUESDAY, 9:30 – 10:15 a.m.
Google’s recent Transparency Report shows that nearly half a million websites are now hosting malware, an increase of 160 percent from this time last year. Higher education websites are particularly attractive to attackers, offering access to large amounts of bandwidth and broad network space. In this session, we will examine blackbox scanning tools to discover what types of information your WordPress site might be leaking to attackers. Then we’ll explore steps we can take to stop this information leakage — one key segment of a larger strategy to fortify WordPress sites. When everybody and their grandmothers get hacked, universities and colleges are easy targets. Even if it’s just to get some basics about website security, it makes sense to attend this session. Better safe than sorry, right? TUESDAY, 10:45 – 11:30 a.m. The use of social media in higher education recruitment is a common practice, often used to supplement more traditional print and email-based outreach methods. Are institutions doing all they can to strategically reach students during the yield period? Are we using the right media and messaging? In 2015, Dr. Corie Martin completed a nationwide research study on admissions and marketing recruitment outreach activities and observed thousands of student interactions within university social media communities. The results of the study showed what was really important to students and suggested how Higher Ed leadership might prepare for the next generation of prospective students. I’m usually biased when it comes to research data. Dr. Corie Martin will share in this session the results of her doctoral research on how prospective students use social media. I’ve selected this session for the program of our 4th Higher Ed Social Media Conference (Nov 30), so it’s no surprise I recommend it. TUESDAY, 11:45 a.m. – 12:30 p.m. Whether you’re pitching a new project to your senior leadership, or you’re talking about an idea or successful campaign to a conference audience, knowing your audience and how to communicate to them is key. In this presentation, Karlyn Borysenko and Jeff Stevens will share best practices on how to identify your audience needs, how to craft the perfect presentation proposal, how to construct slide decks that communicate key ideas and keep the audience fully engaged, and tips and tricks from award winning presenters. Karlyn and Jeff are both amazing, engaging presenters. Presentation skills are crucial to succeed in whatever you want to do (minus a career in coding maybe) in higher education. Moreover, this session promises to be a real entertaining show (I’ve heard about some singing being included). “Anything invented after you’re 35 is against the natural order of things.” — Douglas Adams Let’s say you are in charge of your institution’s social media presence and strategy, but you’ve tried and failed several times to come to grips with the fastest growing platform among people under the age of 25. Your students and prospective students, in other words. If this sounds like you, then hello. I’m old, too. It’s nice to meet you. In this presentation, we will walk together hand-in-hand through the sometimes mystifying Snapchat interface, we will discuss the features of the app that differentiate it from other social platforms, and will look at some examples of how universities and colleges are using Snapchat to connect with their students and prospective students. And if you are under 35 and this all makes total sense to you, you’ll at least get a laugh. Impossible to deny the reach and success of Snapchat among young adults. For older users (and people used to good user design ;-), the popular new kid of the social media platform block has proved to be challenging and often intimidating. Whether you like it or not, if you work in higher education, you need to have a good understanding on how Snapchat works. This session is your chance. TUESDAY, 3:00 – 3:45 p.m.
We’ve all spent countless hours and months — for many of us, years — growing our Facebook page likes and optimizing our content and calendars. Yet each year our organic reach shrinks, and our carefully crafted posts reach a smaller percentage of our fans. The reason for this is obvious: Facebook wants us to pay. The good news is, with even a small budget, you can make use of Facebook’s robust, detailed, and, at times, creepy knowledge of their consumers, and spend your money and your energy reaching your target audiences. This session will focus on the backend of Facebook’s native advertising tools, covering Facebook Power Editor, advanced keyword and geo-targeting, email match, remarketing, conversion tracking, Google Analytics integration, and more. We’ll also touch on Instagram advertising, as it relates to Facebook, and touch on Twitter and LinkedIn as a bonus if time allows. Bring your laptops, your questions, and any of your own experiences with Facebook advertising to share–together we’ll cut through the noise and get our content back in front of the people who care about it! Organic reach on social media isn’t what it used to be. Blame Facebook’s desire to make more money and play with its algorithm. This session looks like a very useful overview of what you need to know to take your first steps in the wonderful world of paid social. TUESDAY, 4:15 – 5:00 p.m.
Aaron Baker, Digital Analytics Lead for Harvard University Public Affairs & Communications, will walk through his editorial calendar for analytics reports, touching on everything from how Google Analytics and Tag Manager work together to how that data should be interpreted and reported to managers and executives. Aaron will also talk about the process he used to build a data landscape for Harvard.edu and the Gazette news website, investigating and integrating multiple data sources for combined analytic data on email, social, and web. You will learn how to map out your own data landscape of what data you have, where it comes from, where it resides now, and what your access is to it. You will learn how to pick which KPIs you should keep track of and what metrics you should use to report to your leadership. There’s no doubt that measurement is an important strategic component of digital marketing and communication. Unfortunately, higher education has too few full-timers working in analytics. This session is your chance to pick up some useful tips and make you dream about what can be done with a focus on data. Presenting at #heweb16, but not on this list yet? Tell us more about your session (and what people will learn if they attend) by posting a comment! 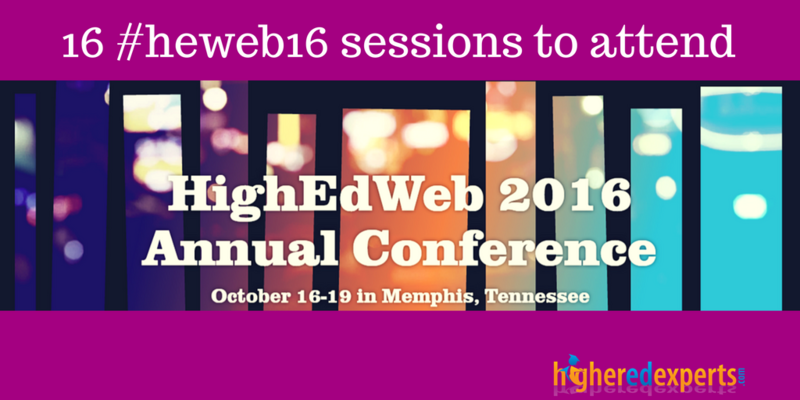 16 #heweb16 conference sessions to attend in Memphis, TN on Oct 17-19 https://t.co/QZGKCAX3mc? 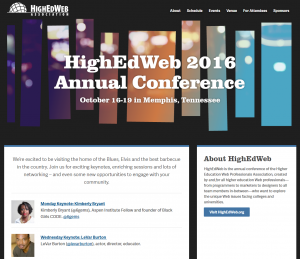 16 #heweb16 conference sessions to attend in Memphis, TN on Oct 17-19 https://t.co/ujKfRnRcGP? oh, man. Now the pressure is on! Bummed you won’t be able to attend this year, but sincerely thank you for including my presentation in your list. I know this focuses on sessions, but our poster is going to be pretty sweet as well. We’ll be sharing our formula for successful web maintenance in a decentralized world.